Tune into Radio Carly: Doing what I love. Jumping from the sky. The more writing and speaking I do, the more I realise that's what I want to do. I want to make a living as a creative, I want to influence peoples' perceptions about visible difference and appearance and I want to be proud of everything I produce. Yet after being securely employed for now over one third of my life, with a regular salary that allows me to live a pretty active life, very good conditions that support my sometimes unpredictable illness, managers that support my career goals - both in my day job and outside, engaging work that I know is contributing to the greater good, and a wonderful group of colleagues, I am too comfortable, risk averse and scared to make the transition from a full time day job, working for the man, to doing more of what I love. I can't imagine giving this day job career totally away, but if I am honest, I'd like to work so that I can work for the man and for myself comfortably. I want to write more away from this blog - and I have so many drafts but sometimes run out of energy to finish them. I spend so much time out of work working on my writing and speaking that I feel guilty when I take a break. I stay up late, I wake up early, I read and network and write down ideas. I never switch off. (An example is that it's not yet 7.00 am and I am writing this blog post, and when I am on the train, I shall draft some tweets to promote my blog in the day.) While doing what I love has never felt like work, I shouldn't feel bad when I take time out to watch the whole season of Girls in one sitting or go to a movie in the day. Tell me, creative types, how do you do it? How do you put food on the table? If you have an agent, how do you make it work for you? Did you make the transition from the corporate world to working for yourself? How do you balance your day job with doing a lot more of your creative work - enabling yourself to make a decent income in both, and most importantly, without burning yourself out? And how do you keep up the motivation without regressing into full procrastination mode? I may seem productive but there's a danger that I could while away my days reading blogs in between naps. 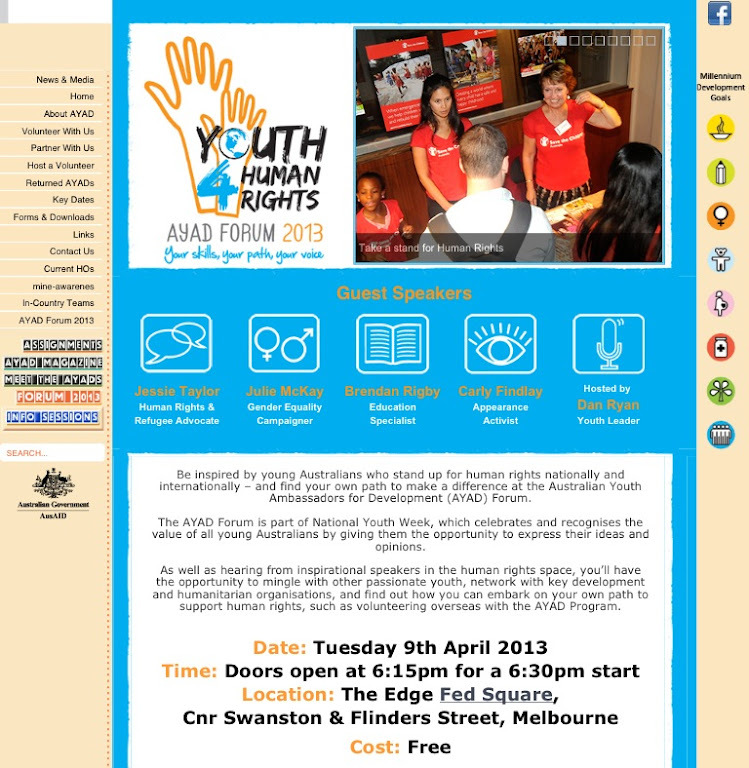 On 9 April I'll be speaking at the Youth 4 Human Rights Forum at Federation Square in Melbourne. It's free and if you're interested in making a difference, you should come! The forum is aimed at helping young people focus on development issues and volunteering during National Youth Week (and beyond). The forum will start the conversion about global issues. I'll be talking about how my blogging has made a difference to connecting and helping people with chronic illness and visible difference. PS: today a dream has come true - my writing has been published on Fairfax's Daily Life website - it's something I've aspired to for a long time. 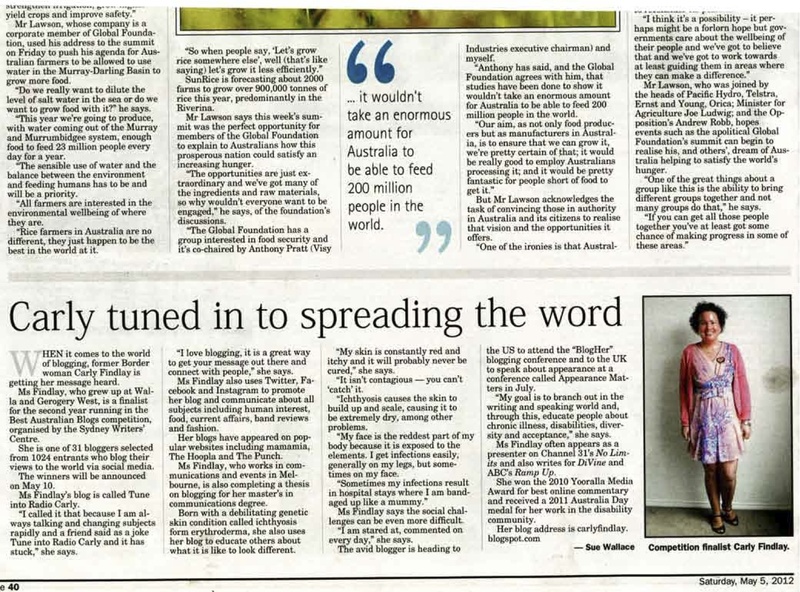 Read my piece here. Congrats on your Daily Life piece, Carly! I totally identify with you - I've only had a secure job for the last two and a bit years and I still can't imagine giving up the regular paycheck. I went to this awesome conference last weekend (http://bigheartedbusiness.clarebowditch.com/) that actually inspired me to do just that. I highly recommend that you head on over and subscribe to their mailing list and maybe go to one of the events they hold. It's awesome.